When our names were announced as the winners of the Civil Service Diversity and Inclusion Award 2016 we both froze. In shock Ellie Binks and I had to then be pushed on the stage to collect our award at the Civil Service Awards ceremony. 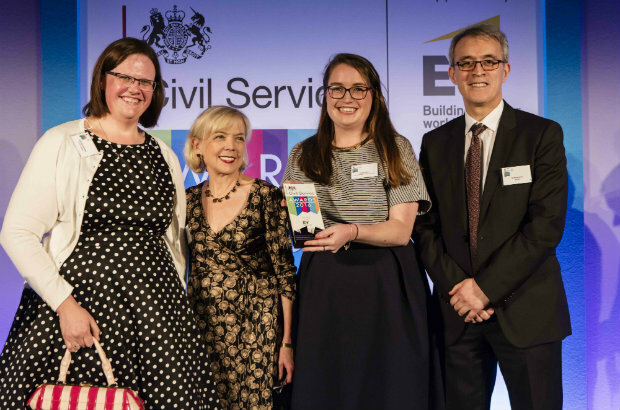 The award ceremony in Lancaster House is not a typical day in the life of someone who works for the Environment Agency or Her Majesty’s Prison and Probation Service (Ellie). Actually, knowing that somebody took the time to nominate us meant everything to us, so seeing our names on the trophy was a bit of a blur and we were in shock for quite a few weeks after. It’s very strange to win an award for something you love doing, and is really important, but is not actually your day job. I met Ellie by chance and together we developed our initial idea to connect women and gender network leads together to share best practice across government. Both of us are ‘do-ers’, we roll up our sleeves and get stuck into a task so this idea quickly grew into the launch of the Cross Government Women’s Network. Back then we didn’t envisage it growing into a network of 150 network leads in over 40 government departments and agencies. One of our proudest moments was celebrating International Women’s Day this year. It focussed on intersectionality of diversity under the slogan ‘Brilliantly Diverse’. We were stunned when we found out we were nominated for the Civil Service Awards. The messages of congratulations just kept coming post awards ceremony. I’ve never felt so proud, and my mum and dad were also proudly sharing the news with all of their friends. I really want others to experience this feeling so since the award I’ve been on a nomination frenzy to nominate colleagues who deserve recognition for their work. Winning a Civil Service Award has been a highlight of my career to date. For Ellie and me, it was the biggest thank you we could receive. Life has changed after the award, including my role. I’ve realised that Diversity and Inclusion is my passion, so I’ve changed roles to do just that. I now support Melanie Dawes (Permanent Secretary of DCLG) in her role as Gender Champion. I’m looking forward to working with Gender Champions and the Cross Government Women’s Network on exciting projects next year, including celebrating the women’s suffrage centenary, publication of gender pay gaps, and looking at the diversity culture of all government departments and agencies. Thinking back to Lancaster House and being pushed forward to collect the award, things have changed a lot since then. I have nominated colleagues this year because I want them to know how much I appreciate what they do. What better way to say thank you. Congratulations Keela and the Team on your award. I am really glad that your engagement on the Diversity and Inclusion Agenda has empowered you to move onto a new role.